Bulletstorm: Full Clip Edition is available for free for one month only for PSN members, seven years after the original released for PS3. But want into the making of the remaster? And what does Full Clip bring to the table that the 2011 release couldn’t? We caught up with Sebastian Wojciechowski from our team to find out more about how we brought Bulletstorm to life for a new console generation. 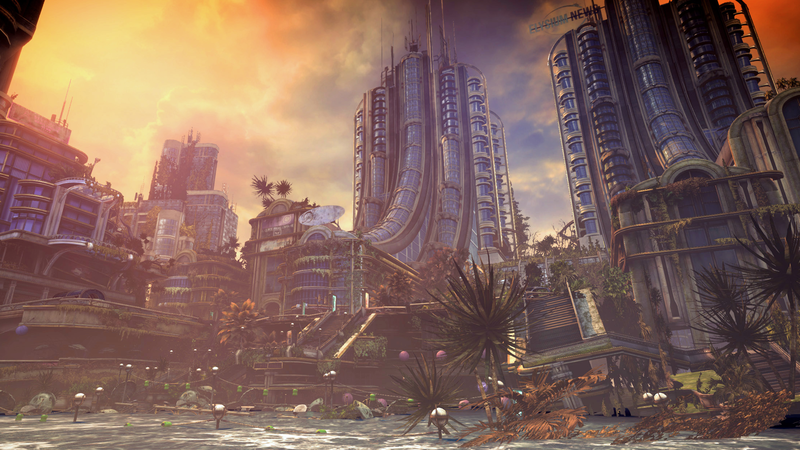 Bulletstorm was a game that we always wanted to create. We wanted it to be a crazy and violent ride without seatbelts on and no compromises whatsoever. We were heavily inspired by the classic shooter genre, but we wanted to weave a few of our own gameplay solutions into the mix too – such as our legendary skillshots, the unusual game setting and the vision of the world. Grayson Hunt is our child and we are proud of everything he – and we – did in the original Bulletstorm on PS3. So it should come as no surprise that as soon as we discovered the power of the new consoles. we’ve decided that we had to show what we had done to the world again. 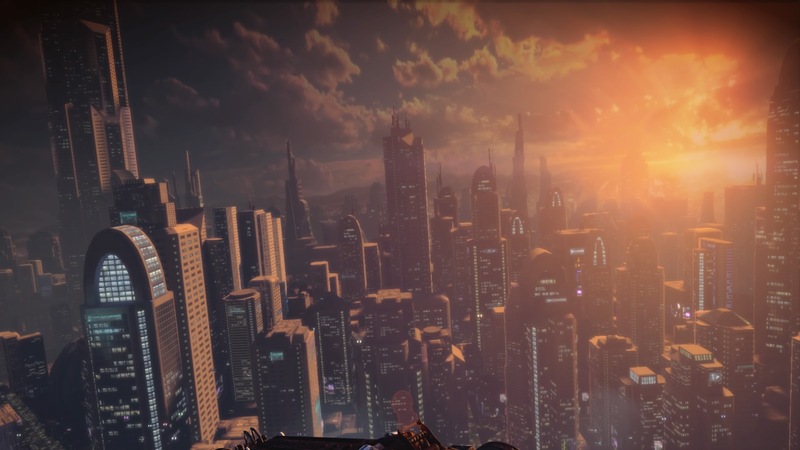 Although Bulletstorm: Full Clip Edition premiered in 2017, its development has been in fact going on since 2015, when we’ve come back as People Can Fly, working again by ourselves. (here is a link to a note about parting with Epic). Players often wonder if making a remaster of any game is a challenge for the studio. We know that it’s common to think that remastering a game is a simple way of cashing in, but that’s far from the truth. For one, we felt that a remaster gave us a chance to deliver the story of Grayson Hunt to as many people as possible in the best way possible. Due to the power of the console generation at the time, the original game had to be adjusted and adapted to the hardware capabilities of the PS3 and Xbox 360. By remastering the game for PlayStation 4 and Xbox One, it allowed us to fully realize the vision that we had in our heads while working on the original. On top of that, remastering a game isn’t an easy technical undertaking or quick to do. Estimating the time of production for any game is always the biggest difficulty, all the more so when creating a remaster that – on paper – should seem simple. Initially, we thought that preparing the code would take us, a team of 3-6 people, about six months to sort out. Jarosław Surowiec, our programmer, likes to remind us that the code actually took 18 months to prepare and that the team was much bigger than the handful of people at the outset. On a day to day basis, we became more and more aware of the amount of work that had to be done – to the point we focused solely on the console version while outsourcing the Steam version. In the end, this was really beneficial to the team. It taught us a lot about how the current generation of consoles worked and it has helped our team master development for them. But we can also say with a lot of confidence that when a studio says it’s working on a remaster, it really means they’re working hard on it. One of the biggest reasons why we remastered Bulletstorm is that we wanted to see what we could make when the restrictions of the old console generation was removed. As we worked on the remaster, we were able to get rid of many things caused by the limitations of the previous devices. For example, we replaced 2D renders in the backgrounds with 3D models on which they were originally based – much to the delight of Krzysztof Dolas, our Lead Artist. We were also able to benefit from the huge amount of extra memory on the newer devices. On the previous generation you had to fit the game in about 190 MB, not mentioning the textures and assets. But the game code and levels had to be cramped into this small space, so it was a big challenge to code. We had to devise a lot of tricks to make it work at all, something which Jarosław spent a lot of time doing. But with the newer generation of consoles, we had eight times more memory at our disposal. This allowed us to remove many of the tricks and restraints we previously had, while also letting us create a smoother experience by getting rid of little annoyances like loading screens. In addition, we got rid of loading screens, which slightly spoiled the smoothness of the experience. We were also able to get the game running at 60 frames per second. This was a huge challenge to the whole team. The original Bulletstorm didn’t run at 60 FPS, but we wanted to bring it up to that mark to fit modern player expectations. 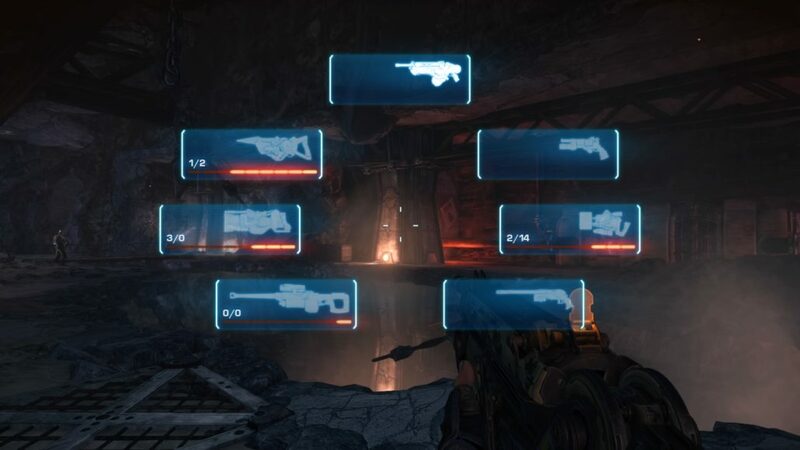 This meant that we did downgraded a few effects – such as dirt and noise effects – in some places to keep it running as smoothly as possible and to tightly fit Bulletstorm’s slightly “cartoonish” style. Lastly, the decision to remaster did also force us to make some changes to the game. We didn’t want to translate it into a new engine and build it from scratch. Instead, we aimed to port the existing code to the next console generation and improve it to bring it closer to our vision. But even porting the existing code to the next generation consoles didn’t turn out to be as easy as it might seem. Our developers had to rewrite many elements of the game from scratch to adapt to life on a different console. Old solutions and scripts turned out to be incompatible with the new gaming hardware. For Full Clip’s graphic designers it was mostly fun, but for the coding team it was a lot of hard but very satisfying work! Of course, we couldn’t give our fans a new version of the game without enriching it with new features. We wouldn’t be us if we hadn’t been thinking about how to improve our title since its release; after all, we are a bunch of passionate perfectionists! The biggest way we sought to change the game was through adding many forms of new game + to the mix to support our dedicated players. Eventually though, we changed our approach to give players maximum fun, access to all weapons and skills from the very beginning to reward them for picking the game up. We did have to balance this out a bit, to make sure the game flowed properly and that the weapons didn’t clash with our level design. But the idea was to offer pure fun from the beginning and we think we achieved that. The one thing that we didn’t manage to achieve was a fully fledged co-op mode for the whole feature campaign. Porting the network code turned out to be extremely cumbersome. We managed to launch the campaign for a single player on new consoles quite efficiently, while multi didn’t want to start. Combined with other technical and certification challenges, it became a no goer. That’s why we decided to add Anarchy mode to the remaster, which is all about a team of players fighting against AI controlled opponents in closed arenas. It wasn’t quite the co-operative gameplay we wanted to achieve, but we think that it was a really enjoyable mode that played to many of Bulletstorm’s strengths. Ultimately, we’re proud that our game has finally achieved the form we’ve dreamt of since the idea for Bulletstorm appeared in our minds. We’re also pleased that so many players picked up a copy of the game, proving to us that there is still real interest in this IP. But for now, we’re looking ahead to something new. Bulletstorm: Full Clip has taught us so much about developing great FPSes for the current console generation and we think the lessons we learnt from it will prove very useful while working on our new AAA shooter. What better way to help people bond than a party? 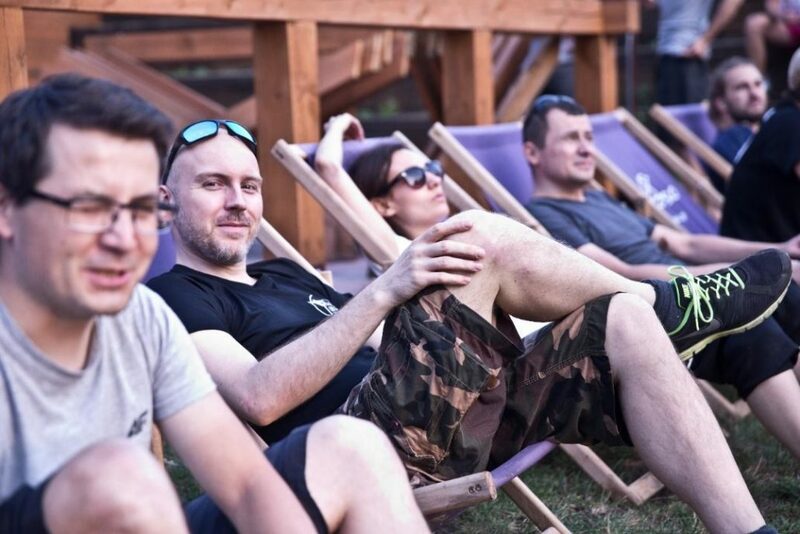 From 7-9 September 2018, the entire team travelled to beautiful Otwock, near Warsaw, in order to spend some quality time together. This was a great opportunity for the new and old studio members alike to get to know each other better. Despite everyone’s strong passion for work and their love for games, we know that physical activity is as a key part of the team’s wellbeing. We decided our trip would achieve team-building and fitness goals by having a survival theme. The weather was beautiful as we set off at noon on Friday. Straight after lunch at the hotel, we headed to the magnificent Świder River to face the challenge of the rapids! 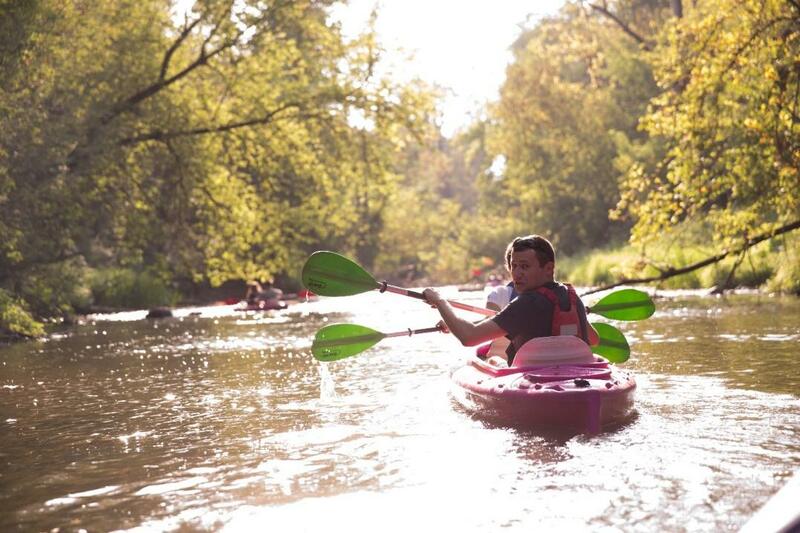 There was a mixture of fun and fear, especially for those who were kayaking for the first time. The river was kind to us on the day, giving us a thrilling yet safe experience on the water. The team were great, keeping to all safety requirements and showcasing their masterful teamwork abilities. It’s no wonder that the team can create such amazing virtual worlds by working together, as they’d shown in a completely new context. It was then time to party – after spending time drying off first! The bowling alley was our next destination, for bowling is an excellent activity to foster support and encourage success. Everyone had a wonderful time, whether they were proficient at bowling or not! Win or lose, the time spent in good company was the real success to be found here. We love shooters. But you probably already know that because you’ve played our games. We made Bulletstorm: Full Clip after all! 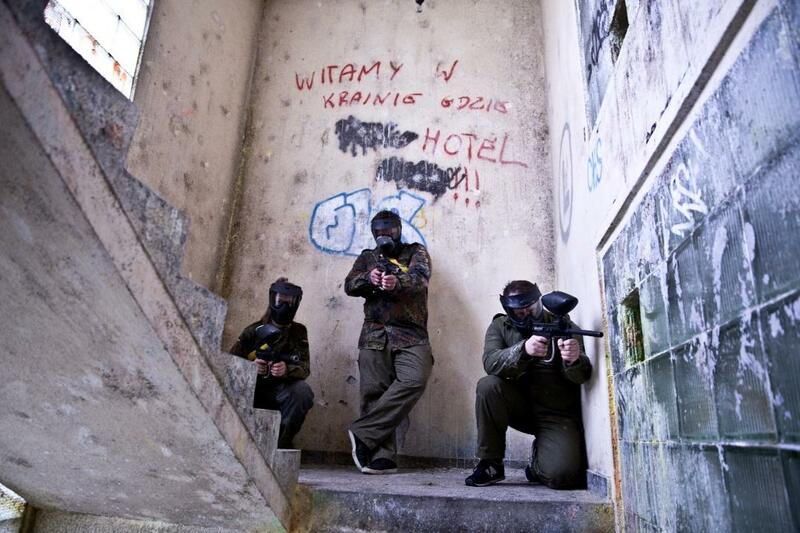 So what better entertainment could there be for first-person shooter masters than paintball? Divided into teams, the mission objective was to collect as many colourful “frags” as possible while avoiding getting shot by the opposing teams! The whole afternoon was spent dodging paintballs and exploring themed buildings in the forest arena. We won’t reveal who won, because for us, what counts the most is healthy competition. But in the People Can Fly team, everyone is a winner. In the evening, it was finally time to sit in front of a screen again. But this time, the keyboard and mouse had been replaced by guitars and drums! We fulfilled some childhood dreams of becoming a rock star as we jammed to Rock Band. 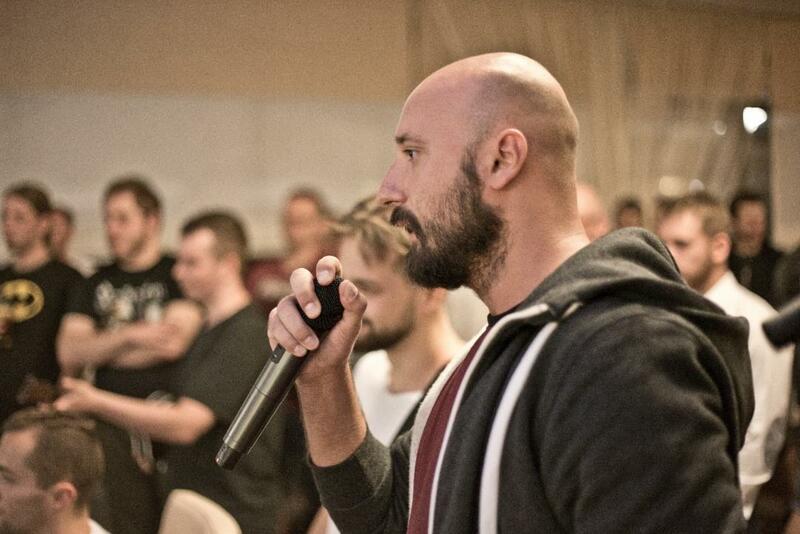 We unearthed some hidden singing talents among the developers! Rock Band is practically a must-have during every gamer meeting, so we couldn’t miss it during our integration as well. We were sad and happy at the same time when the weekend came to a close. We made some fond memories, and the skills learnt and developed will be taken back with us to the studio as we continue to work on providing world-class games with a world-class team. 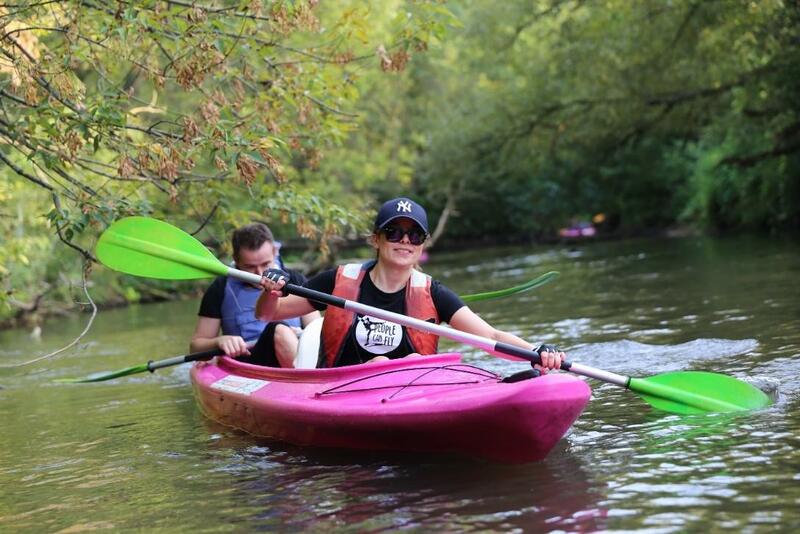 Whether it is paintballing or kayaking, coding or designing, we can be motivated and able to achieve the very best results.